Qualitative data are the result of categorizing or describing attributes of a population. Hair color, blood type, ethnic group, the car a person drives, and the street a person lives on are examples of qualitative data. Qualitative data are generally described by words or letters. For instance, hair color might be black, dark brown, light brown, blonde, gray, or red. Blood type might be AB+, O-, or B+. Researchers often prefer to use quantitative data over qualitative data because it lends itself more easily to mathematical analysis. For example, it does not make sense to find an average hair color or blood type. All data that are the result of measuring are quantitative continuous data assuming that we can measure accurately. Measuring angles in radians might result in such numbers as , , , , , and so on. If you and your friends carry backpacks with books in them to school, the numbers of books in the backpacks are discrete data and the weights of the backpacks are continuous data. The data are the number of books students carry in their backpacks. You sample five students. Two students carry three books, one student carries four books, one student carries two books, and one student carries one book. The numbers of books (three, four, two, and one) are the quantitative discrete data. machines. What type of data is this? The data are the weights of backpacks with books in them. You sample the same five students. The weights (in pounds) of their backpacks are 6.2, 7, 6.8, 9.1, 4.3. Notice that backpacks carrying three books can have different weights. Weights are quantitative continuous data because weights are measured. The data are the areas of lawns in square feet. You sample five houses. The areas of the lawns are 144 sq. feet, 160 sq. feet, 190 sq. feet, 180 sq. feet, and 210 sq. feet. What type of data is this? You go to the supermarket and purchase three cans of soup (19 ounces) tomato bisque, 14.1 ounces lentil, and 19 ounces Italian wedding), two packages of nuts (walnuts and peanuts), four different kinds of vegetable (broccoli, cauliflower, spinach, and carrots), and two desserts (16 ounces Cherry Garcia ice cream and two pounds (32 ounces chocolate chip cookies). The three cans of soup, two packages of nuts, four kinds of vegetables and two desserts are quantitative discrete data because you count them. Types of soups, nuts, vegetables and desserts are qualitative data because they are categorical. the number of classes you take per school year. Items a, e, f, k, and l are quantitative discrete; items d, j, and n are quantitative continuous; items b, c, g, h, i, and m are qualitative. Determine the correct data type (quantitative or qualitative) for the number of cars in a parking lot. Indicate whether quantitative data are continuous or discrete. A statistics professor collects information about the classification of her students as freshmen, sophomores, juniors, or seniors. The data she collects are summarized in the pie chart [link]. What type of data does this graph show? 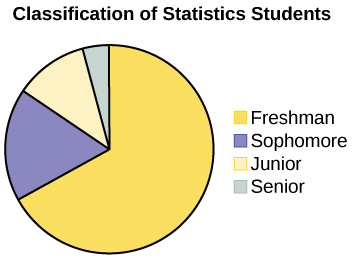 This pie chart shows the students in each year, which is qualitative data. The registrar at State University keeps records of the number of credit hours students complete each semester. The data he collects are summarized in the histogram. The class boundaries are 10 to less than 13, 13 to less than 16, 16 to less than 19, 19 to less than 22, and 22 to less than 25. What type of data does this graph show? 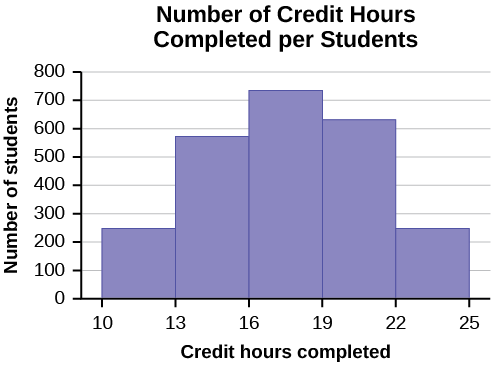 A histogram is used to display quantitative data: the numbers of credit hours completed. Because students can complete only a whole number of hours (no fractions of hours allowed), this data is quantitative discrete. Below are tables comparing the number of part-time and full-time students at De Anza College and Foothill College enrolled for the spring 2010 quarter. The tables display counts (frequencies) and percentages or proportions (relative frequencies). The percent columns make comparing the same categories in the colleges easier. Displaying percentages along with the numbers is often helpful, but it is particularly important when comparing sets of data that do not have the same totals, such as the total enrollments for both colleges in this example. Notice how much larger the percentage for part-time students at Foothill College is compared to De Anza College. Tables are a good way of organizing and displaying data. But graphs can be even more helpful in understanding the data. There are no strict rules concerning which graphs to use. Two graphs that are used to display qualitative data are pie charts and bar graphs. In a pie chart, categories of data are represented by wedges in a circle and are proportional in size to the percent of individuals in each category. In a bar graph, the length of the bar for each category is proportional to the number or percent of individuals in each category. Bars may be vertical or horizontal. Look at [link] and [link] and determine which graph (pie or bar) you think displays the comparisons better. It is a good idea to look at a variety of graphs to see which is the most helpful in displaying the data. We might make different choices of what we think is the “best” graph depending on the data and the context. Our choice also depends on what we are using the data for. Sometimes percentages add up to be more than 100% (or less than 100%). In the graph, the percentages add to more than 100% because students can be in more than one category. A bar graph is appropriate to compare the relative size of the categories. A pie chart cannot be used. It also could not be used if the percentages added to less than 100%. 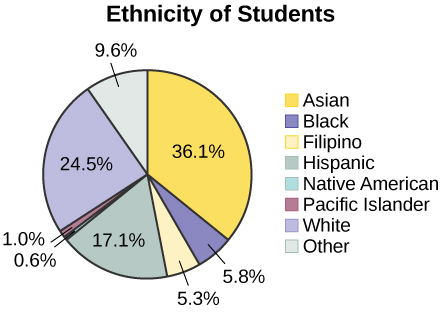 The table displays Ethnicity of Students but is missing the “Other/Unknown” category. This category contains people who did not feel they fit into any of the ethnicity categories or declined to respond. Notice that the frequencies do not add up to the total number of students. In this situation, create a bar graph and not a pie chart. The following graph is the same as the previous graph but the “Other/Unknown” percent (9.6%) has been included. 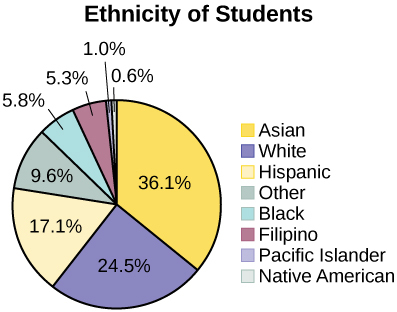 The “Other/Unknown” category is large compared to some of the other categories (Native American, 0.6%, Pacific Islander 1.0%). This is important to know when we think about what the data are telling us. This particular bar graph in [link] can be difficult to understand visually. The graph in [link] is a Pareto chart. The Pareto chart has the bars sorted from largest to smallest and is easier to read and interpret. The following pie charts have the “Other/Unknown” category included (since the percentages must add to 100%). The chart in [link] is organized by the size of each wedge, which makes it a more visually informative graph than the unsorted, alphabetical graph in [link]. could have generated more random numbers. The random numbers 0.94360 and 0.99832 do not contain appropriate two digit numbers. However the third random number, 0.14669, contains 14 (the fourth random number also contains 14), the fifth random number contains 05, and the seventh random number contains 04. The two-digit number 14 corresponds to Macierz, 05 corresponds to Cuningham, and 04 corresponds to Cuarismo. Besides herself, Lisa’s group will consist of Marcierz, Cuningham, and Cuarismo. Press 5:randInt(. Enter 0, 30). Press ENTER two more times for the other 2 random numbers. If there is a repeat press ENTER again. Note: randInt(0, 30, 3) will generate 3 random numbers. To choose a stratified sample, divide the population into groups called strata and then take a proportionate number from each stratum. For example, you could stratify (group) your college population by department and then choose a proportionate simple random sample from each stratum (each department) to get a stratified random sample. To choose a simple random sample from each department, number each member of the first department, number each member of the second department, and do the same for the remaining departments. Then use simple random sampling to choose proportionate numbers from the first department and do the same for each of the remaining departments. Those numbers picked from the first department, picked from the second department, and so on represent the members who make up the stratified sample. To choose a cluster sample, divide the population into clusters (groups) and then randomly select some of the clusters. All the members from these clusters are in the cluster sample. For example, if you randomly sample four departments from your college population, the four departments make up the cluster sample. Divide your college faculty by department. The departments are the clusters. Number each department, and then choose four different numbers using simple random sampling. All members of the four departments with those numbers are the cluster sample. To choose a systematic sample, randomly select a starting point and take every nth piece of data from a listing of the population. For example, suppose you have to do a phone survey. Your phone book contains 20,000 residence listings. You must choose 400 names for the sample. Number the population 1–20,000 and then use a simple random sample to pick a number that represents the first name in the sample. Then choose every fiftieth name thereafter until you have a total of 400 names (you might have to go back to the beginning of your phone list). Systematic sampling is frequently chosen because it is a simple method. A type of sampling that is non-random is convenience sampling. Convenience sampling involves using results that are readily available. For example, a computer software store conducts a marketing study by interviewing potential customers who happen to be in the store browsing through the available software. The results of convenience sampling may be very good in some cases and highly biased (favor certain outcomes) in others. Sampling data should be done very carefully. Collecting data carelessly can have devastating results. Surveys mailed to households and then returned may be very biased (they may favor a certain group). It is better for the person conducting the survey to select the sample respondents. True random sampling is done with replacement. That is, once a member is picked, that member goes back into the population and thus may be chosen more than once. However for practical reasons, in most populations, simple random sampling is done without replacement. Surveys are typically done without replacement. That is, a member of the population may be chosen only once. Most samples are taken from large populations and the sample tends to be small in comparison to the population. Since this is the case, sampling without replacement is approximately the same as sampling with replacement because the chance of picking the same individual more than once with replacement is very low. the chance of picking the same person again is 1 out of 10,000 (very low). you do not replace the first person before picking the next person. Compare the fractions 999/10,000 and 999/9,999. For accuracy, carry the decimal answers to four decimal places. To four decimal places, these numbers are equivalent (0.0999). you are sampling with replacement for any particular sample, then the chance of picking the first person is ten out of 25, and the chance of picking a different second person is nine out of 25 (you replace the first person). If you sample without replacement, then the chance of picking the first person is ten out of 25, and then the chance of picking the second person (who is different) is nine out of 24 (you do not replace the first person). 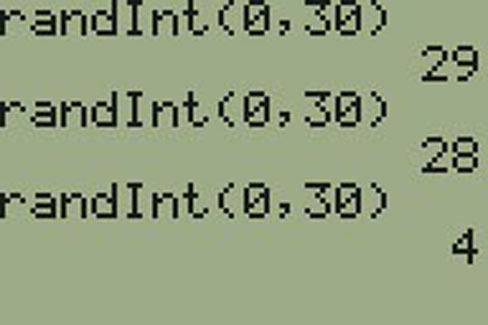 four decimal places, these numbers are not equivalent. In reality, a sample will never be exactly representative of the population so there will always be some sampling error. As a rule, the larger the sample, the smaller the sampling error. In statistics, a sampling bias is created when a sample is collected from a population and some members of the population are not as likely to be chosen as others (remember, each member of the population should have an equally likely chance of being chosen). When a sampling bias happens, there can be incorrect conclusions drawn about the population that is being studied. A study is done to determine the average tuition that San Jose State undergraduate students pay per semester. Each student in the following samples is asked how much tuition he or she paid for the Fall semester. What is the type of sampling in each case? A sample of 100 undergraduate San Jose State students is taken by organizing the students’ names by classification (freshman, sophomore, junior, or senior), and then selecting 25 students from each. A random number generator is used to select a student from the alphabetical listing of all undergraduate students in the Fall semester. Starting with that student, every 50th student is chosen until 75 students are included in the sample. A completely random method is used to select 75 students. Each undergraduate student in the fall semester has the same probability of being chosen at any stage of the sampling process. Number each row one through ten. Press MATH and arrow over to PRB. Press 5:randInt( and enter 1,6). Press ENTER. Record the number. Press ENTER and record that number. The two numbers are for two of the columns. The quiz scores (20 of them) in these 2 columns are the cluster sample. Press MATH. Arrow over to PRB. Press 5:randInt( and enter 1, 60). A student interviews classmates in his algebra class to determine how many pairs of jeans a student owns, on the average. a. No. The first sample probably consists of science-oriented students. Besides the chemistry course, some of them are also taking first-term calculus. Books for these classes tend to be expensive. Most of these students are, more than likely, paying more than the average part-time student for their books. The second sample is a group of senior citizens who are, more than likely, taking courses for health and interest. The amount of money they spend on books is probably much less than the average parttime student. Both samples are biased. Also, in both cases, not all students have a chance to be in either sample. Students often ask if it is “good enough” to take a sample, instead of surveying the entire population. If the survey is done well, the answer is yes. The station uses convenience sampling and surveys the first 200 people they meet at one of the station’s music concert events. 24 people said they’d prefer more talk shows, and 176 people said they’d prefer more music. To find out the most popular cereal among young people under the age of ten, stand outside a large supermarket for three hours and speak to every twentieth child under age ten who enters the supermarket. It was mentioned previously that two or more samples from the same population, taken randomly, and having close to the same characteristics of the population will likely be different from each other. Suppose Doreen and Jung both decide to study the average amount of time students at their college sleep each night. Doreen and Jung each take samples of 500 students. Doreen uses systematic sampling and Jung uses cluster sampling. Doreen’s sample will be different from Jung’s sample. Even if Doreen and Jung used the same sampling method, in all likelihood their samples would be different. Neither would be wrong, however. If Doreen and Jung took larger samples (i.e. the number of data values is increased), their sample results (the average amount of time a student sleeps) might be closer to the actual population average. But still, their samples would be, in all likelihood, different from each other. This variability in samples cannot be stressed enough. The size of a sample (often called the number of observations) is important. The examples you have seen in this book so far have been small. Samples of only a few hundred observations, or even smaller, are sufficient for many purposes. In polling, samples that are from 1,200 to 1,500 observations are considered large enough and good enough if the survey is random and is well done. You will learn why when you study confidence intervals. Be aware that many large samples are biased. For example, call-in surveys are invariably biased, because people choose to respond or not. Did the two experiments have the same results? Probably not. If you did the experiment a third time, do you expect the results to be identical to the first or second experiment? Why or why not? Gallup-Healthways Well-Being Index. http://www.well-beingindex.com/default.asp (accessed May 1, 2013). Gallup-Healthways Well-Being Index. http://www.well-beingindex.com/methodology.asp (accessed May 1, 2013). Gallup-Healthways Well-Being Index. http://www.gallup.com/poll/146822/gallup-healthways-index-questions.aspx (accessed May 1, 2013). Dominic Lusinchi, “’President’ Landon and the 1936 Literary Digest Poll: Were Automobile and Telephone Owners to Blame?” Social Science History 36, no. 1: 23-54 (2012), http://ssh.dukejournals.org/content/36/1/23.abstract (accessed May 1, 2013). “The Literary Digest Poll,” Virtual Laboratories in Probability and Statistics http://www.math.uah.edu/stat/data/LiteraryDigest.html (accessed May 1, 2013). “Gallup Presidential Election Trial-Heat Trends, 1936–2008,” Gallup Politics http://www.gallup.com/poll/110548/gallup-presidential-election-trialheat-trends-19362004.aspx#4 (accessed May 1, 2013). The Data and Story Library, http://lib.stat.cmu.edu/DASL/Datafiles/USCrime.html (accessed May 1, 2013). LBCC Distance Learning (DL) program data in 2010-2011, http://de.lbcc.edu/reports/2010-11/future/highlights.html#focus (accessed May 1, 2013). Data are individual items of information that come from a population or sample. Data may be classified as qualitative, quantitative continuous, or quantitative discrete. “Number of times per week” is what type of data? “Duration (amount of time)” is what type of data? The colors of the houses around the park are what kind of data? [link] contains the total number of deaths worldwide as a result of earthquakes from 2000 to 2012. Use [link] to answer the following questions. In both years, underwater earthquakes produced massive tsunamis. A group of test subjects is divided into twelve groups; then four of the groups are chosen at random. A market researcher polls every tenth person who walks into a store. The first 50 people who walk into a sporting event are polled on their television preferences. A computer generates 100 random numbers, and 100 people whose names correspond with the numbers on the list are chosen. Determine what the key term data refers to in the above example for Researcher A. List two reasons why the data may differ. Can you tell if one researcher is correct and the other one is incorrect? Why? No, we do not have enough information to make such a claim. Would you expect the data to be identical? Why or why not? Since the treatment is not the same the data might be different unless neither treatment has an effect. How might the researchers gather random data? Take a simple random sample from each group. One way is by assigning a number to each patient and using a random number generator to randomly select patients. Suppose that the first researcher conducted his survey by randomly choosing one state in the nation and then randomly picking 40 patients from that state. What sampling method would that researcher have used? He has used a simple random sample method. Suppose that the second researcher conducted his survey by choosing 40 patients he knew. What sampling method would that researcher have used? What concerns would you have about this data set, based upon the data collection method? This would be convenience sampling and is not random. Give a reason why the data may differ. The researchers are studying different groups, so there will be some variation in the data. Would the sample size be large enough if the population is the students in the school? Yes, the sample size of 150 would be large enough to reflect a population of one school. Would the sample size be large enough if the population is school-aged children and young adults in the United States? There are many school-aged children and young adults in the United States, and the study was done at only one school, so the sample size is not large enough to reflect the population. Researcher A concludes that most students play video games between four and six hours each week. Researcher B concludes that most students play video games between two and four hours each week. Who is correct? Even though the specific data support each researcher’s conclusions, the different results suggest that more data need to be collected before the researchers can reach a conclusion. As part of a way to reward students for participating in the survey, the researchers gave each student a gift card to a video game store. Would this affect the data if students knew about the award before the study? Yes, people who play games more might be more likely to participate, since they would want the gift card more than a student who does not play video games. This would leave out many students who do not play games at all and skew the data. Use the following data to answer the next five exercises: A pair of studies was performed to measure the effectiveness of a new software program designed to help stroke patients regain their problem-solving skills. Patients were asked to use the software program twice a day, once in the morning and once in the evening. The studies observed 200 stroke patients recovering over a period of several weeks. The first study collected the data in [link]. The second study collected the data in [link]. Given what you know, which study is correct? There is not enough information given to judge if either one is correct or incorrect. The first study was performed by the company that designed the software program. The second study was performed by the American Medical Association. Which study is more reliable? The second study is more reliable, because the company would be interested in showing results that favored a higher rate of improvement from patients using their software. The data may be skewed; however, the American Medical Association is not concerned with the success of the software and so should be objective. Both groups that performed the study concluded that the software works. Is this accurate? The software program seems to work because the second study shows that more patients improve while using the software than not. Even though the difference is not as large as that in the first study, the results from the second study are likely more reliable and still show improvement. The company takes the two studies as proof that their software causes mental improvement in stroke patients. Is this a fair statement? No, the data suggest the two are correlated, but more studies need to be done to prove that using the software causes improvement in stroke patients. Patients who used the software were also a part of an exercise program whereas patients who did not use the software were not. Does this change the validity of the conclusions from [link]? Yes, because we cannot tell if the improvement was due to the software or the exercise; the data is confounded, and a reliable conclusion cannot be drawn. New studies should be performed. Is a sample size of 1,000 a reliable measure for a population of 5,000? Yes, 1,000 represents 20% of the population and should be representative, if the population of the sample is chosen at random. Is a sample of 500 volunteers a reliable measure for a population of 2,500? No, even though the sample is large enough, the fact that the sample consists of volunteers makes it a self-selected sample, which is not reliable. A question on a survey reads: “Do you prefer the delicious taste of Brand X or the taste of Brand Y?” Is this a fair question? No, the question is creating undue influence by adding the word “delicious” to describe Brand X. The wording may influence responses. Is a sample size of two representative of a population of five? No, even though the sample is a large portion of the population, two responses are not enough to justify any conclusions. Because the population is so small, it would be better to include everyone in the population to get the most accurate data. Is it possible for two experiments to be well run with similar sample sizes to get different data? Yes, there will most likely be a degree of variation between any two studies, even if they are set up and run the same way. Each study may be affected differently by unknown factors such as location, mood of the subjects, or time of year. The survey was conducted using six similar flights. The survey would not be a true representation of the entire population of air travelers. Conducting the survey on a holiday weekend will not produce representative results. Conduct the survey during different times of the year. Conduct the survey using flights to and from various locations. Conduct the survey on different days of the week. Suppose you want to determine the mean number of students per statistics class in your state. Answers will vary. Sample Answer: You could use a systematic sampling method. Stop the tenth person as they leave one of the buildings on campus at 9:50 in the morning. Then stop the tenth person as they leave a different building on campus at 1:50 in the afternoon. Answers will vary. Sample Answer: Many people will not respond to mail surveys. If they do respond to the surveys, you can’t be sure who is responding. In addition, mailing lists can be incomplete. Ask everyone to include their age then take a random sample from the data. Include in the report how the survey was conducted and why the results may not be accurate. since 1971, the year the microprocessor was invented). It was reported that 48% of those individuals surveyed stated that if they had 2,000 to spend, they would use it for computer equipment. Also, 66% of those surveyed considered themselves relatively savvy computer users. Yes, in polling, samples that are from 1,200 to 1,500 observations are considered large enough and good enough if the survey is random and is well done. We do not have enough information to decide if this is a random sample from the U.S. population. No, this is a convenience sample taken from individuals who visited an exhibition in the Angeles Convention Center. This sample is not representative of the U.S. population. It is possible that the two sample statistics, 48% and 66% are larger than the true parameters in the population at large. In any event, no conclusion about the population proportions can be inferred from this convenience sample. The Gallup-Healthways Well-Being Index is a survey that follows trends of U.S. residents on a regular basis. There are six areas of health and wellness covered in the survey: Life Evaluation, Emotional Health, Physical Health, Healthy Behavior, Work Environment, and Basic Access. Some of the questions used to measure the Index are listed below. In advance of the 1936 Presidential Election, a magazine titled Literary Digest released the results of an opinion poll predicting that the republican candidate Alf Landon would win by a large margin. The magazine sent post cards to approximately 10,000,000 prospective voters. These prospective voters were selected from the subscription list of the magazine, from automobile registration lists, from phone lists, and from club membership lists. Approximately 2,300,000 people returned the postcards. The country was in the middle of the Great Depression and many people could not afford these “luxury” items and therefore not able to be included in the survey. Samples that are too small can lead to sampling bias. Crime-related and demographic statistics for 47 US states in 1960 were collected from government agencies, including the FBI’s Uniform Crime Report. One analysis of this data found a strong connection between education and crime indicating that higher levels of education in a community correspond to higher crime rates. Which of the potential problems with samples discussed in [link] could explain this connection? Causality: The fact that two variables are related does not guarantee that one variable is influencing the other. We cannot assume that crime rate impacts education level or that education level impacts crime rate. Confounding: There are many factors that define a community other than education level and crime rate. Communities with high crime rates and high education levels may have other lurking variables that distinguish them from communities with lower crime rates and lower education levels. Because we cannot isolate these variables of interest, we cannot draw valid conclusions about the connection between education and crime. Possible lurking variables include police expenditures, unemployment levels, region, average age, and size. Self-Selected Samples: Only people who are interested in the topic are choosing to respond. Sample Size Issues: A sample with only 11 participants will not accurately represent the opinions of a nation. Undue Influence: The question is wording in a specific way to generate a specific response. Self-Funded or Self-Interest Studies: This question was generated to support one person’s claim and it was designed to get the answer that the person desires. When a large number of people refuse to participate, then the sample may not have the same characteristics of the population. Perhaps the majority of people willing to participate are doing so because they feel strongly about the subject of the survey. 2010-11 academic year. Highlights of the summary report are listed in [link]. percentages would be the same? Why? Not necessarily. Long beach City is the seventh largest in California the college has an enrollment of approximately 27,000 students. On the other hand, Great Basin College has its campuses in rural northeastern Nevada, and its enrollment of about 3,500 students. subjects that he investigated are all in mathematics and the sciences; there are many subjects in the humanities, social sciences, and other subject areas, (for example: literature, art, history, psychology, sociology, business) that he did not investigate at all. It may be that different subject areas exhibit different patterns of textbook availability, but his sample would not detect such results. the most popular textbooks may be harder to find available online, because more student demand exhausts the supply more quickly. In reality, many college students do not use the most popular textbook in their subject, and this study gives no useful information about the situation for those less popular textbooks. mixed representation of both the most popular and less popular textbooks. 1 lastbaldeagle. 2013. On Tax Day, House to Call for Firing Federal Workers Who Owe Back Taxes. Opinion poll posted online at: http://www.youpolls.com/details.aspx?id=12328 (accessed May 1, 2013). 2 Scott Keeter et al., “Gauging the Impact of Growing Nonresponse on Estimates from a National RDD Telephone Survey,” Public Opinion Quarterly 70 no. 5 (2006), http://poq.oxfordjournals.org/content/70/5/759.full (accessed May 1, 2013). 3 Frequently Asked Questions, Pew Research Center for the People & the Press, http://www.people-press.org/methodology/frequently-asked-questions/#dont-you-have-trouble-getting-people-to-answer-your-polls (accessed May 1, 2013). a random variable (RV) whose outcomes are measured; the height of trees in the forest is a continuous RV. a nonrandom method of selecting a sample; this method selects individuals that are easily accessible and may result in biased data. an issue that affects the reliability of sampling data other than natural variation; it includes a variety of human errors including poor study design, biased sampling methods, inaccurate information provided by study participants, data entry errors, and poor analysis. a method of selecting a sample that gives every member of the population an equal chance of being selected. the natural variation that results from selecting a sample to represent a larger population; this variation decreases as the sample size increases, so selecting larger samples reduces sampling error. Once a member of the population is selected for inclusion in a sample, that member is returned to the population for the selection of the next individual. A member of the population may be chosen for inclusion in a sample only once. If chosen, the member is not returned to the population before the next selection. a straightforward method for selecting a random sample; give each member of the population a number. Use a random number generator to select a set of labels. These randomly selected labels identify the members of your sample. a method for selecting a random sample used to ensure that subgroups of the population are represented adequately; divide the population into groups (strata). Use simple random sampling to identify a proportionate number of individuals from each stratum. a method for selecting a random sample; list the members of the population. Use simple random sampling to select a starting point in the population. Let k = (number of individuals in the population)/(number of individuals needed in the sample). Choose every kth individual in the list starting with the one that was randomly selected. If necessary, return to the beginning of the population list to complete your sample. Data, Sampling, and Variation in Data and Sampling by OpenStaxCollege is licensed under a Creative Commons Attribution 4.0 International License, except where otherwise noted.